The David Round Company is a leading supplier of Trolleys & Carriers. Select from stainless steel trolleys, fixed wheel and articulating styles. Leaders in design and innovation, David Round manufactures manual, hand-geared and motorized versions of stainless steel trolley products. 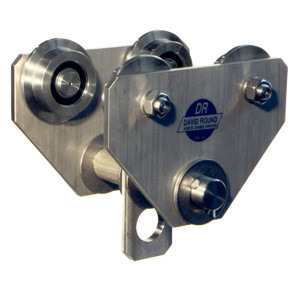 These stainless hoist trolley products are ideal for pharmaceutical, food manufacturing or other environments requiring wash down sanitary equipment or corrosion resistance. Articulating wheel models negotiate curves and switches along monorails. Stainless steel trolleys allow hoist to be easily moved around the plant to provide precise positioning with minimal physical effort. David Round has a complete line of stainless steel chain hoist, cleanroom strap hoist and stainless steel wire rope hoist products to complement these trolleys. When specified, we can provide high finish surfaces, with glass bead treatment performed on-site in our facility to control finish quality. David Round’s fixed wheel trolleys are available to support hook mounted chain hoists. These trolleys are ideal for working on assembly lines. Specialty trolleys are also manufactured for such applications as hot melt ladle handling. We offer capacities from 1/4 to 50 tons. Often required to meet tight radius requirements, The David Round Company’s articulating trolleys feature guide rollers. Low profile trolley designs negotiate switches on patented track systems. These trolleys are ideal for track curves. Need other cleanroom equipment? Check out our full line of stainless steel material handling equipment!